Led by founder Bill Wood, Wilwood Engineering is a global leader and manufacturer of high-performance, Original Equipment (OE), disc brake solutions. We offer a full range of capabilities and services for delivering complete end-to-end solutions. As an OE partner, Wilwood offers short lead-times on custom OE parts, production and delivery, including initial design, engineering and rapid prototyping solutions. We pass along significant cost savings provided by more than 30 years of experience in brake solutions, design and high-volume production. Wilwood provides engineering analysis of your supplied project requirements, or develops requirements and specifications for you through our highly-accessible engineering staff. Where custom braking solutions include existing components, we draw from a well-stocked, off-the-shelf inventory. Original Equipment Manufacturing (OEM) disc brake systems are engineered for severe environment, mission-critical, extreme-duty and tight-tolerance applications. 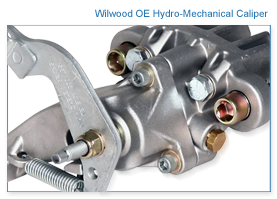 We provide solutions for applications requiring any brake-related components, including hydraulic and mechanical calipers, master cylinders, pedals, drum brakes, rotors, proportioning valves, and other suspension-related components such as hubs, spindles and custom support bracketry. Digital coordinates measuring and 3D mapping for fitment assurance.